When I was five or six, I got out of bed one night to get a drink of water. As I walked by the living room where my mom and dad were watching TV, a woman on the screen was clawing her way out of an earthen grave. The sight of that mud-covered hand and sound of her choked breathing left me frozen with fear. 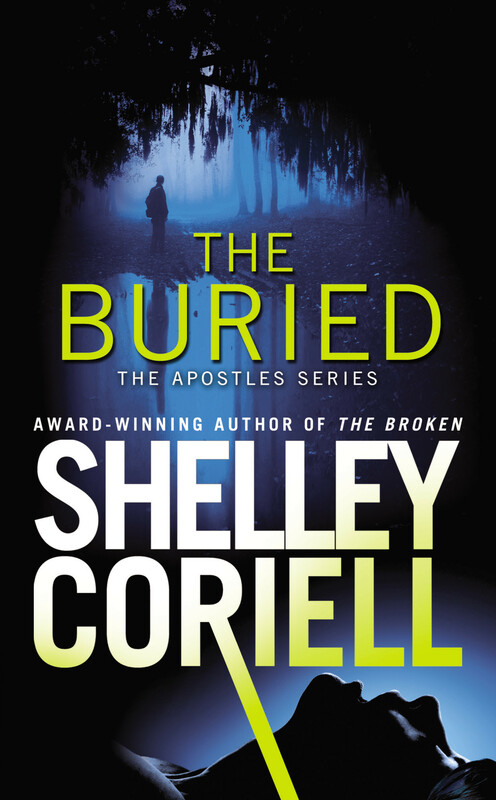 In THE BURIED, Grace Courtemanche—an ambitious, successful state prosecutor—is pulled into a world of terror and self-doubt when she receives calls from victims buried alive, and she must turn to the one man she swore she’d never need again, Hatch Hatcher, a rootless, smooth-talking FBI crisis negotiator in town to deal with a long-buried secret of his own. Grace and Hatch’s story, book #2 in the Apostles Series featuring Parker Lord’s elite FBI team, was a tough one for me to write. I actually had to set it aside for two years because it was too dark. But when I finally figured out what the story was really about—family—I found my light, and even a bit of laughter, to balance all that dark. As the bay of hounds tapered off, the huddle of men and women in the parking lot broke, moving swiftly. Hatch, on the other hand, moseyed to her side, his gait slow and easy, but there was nothing conciliatory in his eyes. “You should have told me.” His mouth and jaw barely moved as he spoke. The words, the closeness, so Hatch. For a moment, she considered sinking into his strength and warmth, which proved how deeply rattled she was by the past twenty-four hours. Hatch didn’t seem to notice the crazy thoughts flitting around her brain. He grabbed her elbow and led her toward a sheriff’s department SUV. “I’m not going home.” Her boots dug into the damp earth. “That’s obvious.” He pointed to the seat. Grace cradled the coin in her palm. She’d already played the phone messages from Lia, listening for ambient sounds, ideally something like a jet plane, which could be tracked. But in all of the voicemails, she’d heard nothing but Lia’s increasingly desperate words. I’m in a bad place, a really bad place. A hand settled on her knee. Golden and steady. This was not Hatch her ex-husband but Hatch the Apostle. Hatch who was a master in a crisis situation. She ran her thumb over the face of the coin, and with quirked lips tossed it in the air. The coin spun and fell on the ground between them. “Left.” Hatch pocketed the coin and with a seriousness she’d never seen from him, climbed into the SUV and drove into the swamp to find a girl who’d been buried alive. 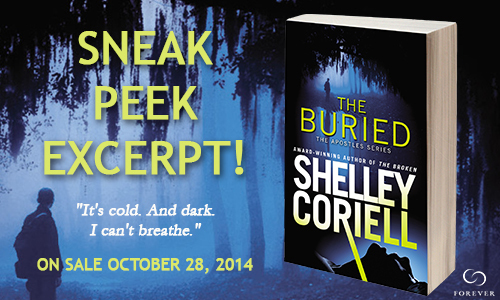 Win a copy of THE BURIED Here! Successful, ambitious state prosecutor Grace Courtemanche is at the top of her game. Then she gets a chilling call from a young woman claiming to be buried alive. Desperate to find the victim before it’s too late, Grace will do whatever it takes . . . even if it means excavating the darkest secrets of her own past and turning to the one man she thought she would never see again.FBI agent Theodore “Hatch” Hatcher is a man without roots-and that’s the way he likes it. But when a grisly crime shatters Cyprus Bend, Florida, Hatch is dragged back to the small town-and the one woman-he hoped was in his rearview for good. Forced to confront the wreckage of their love affair, Hatch and Grace may just find that sometimes the deepest wounds leave the most beautiful scars-and that history repeating itself may just be what they need to stop a killer . . . and save their own hearts. A former newspaper reporter, magazine editor, and restaurant reviewer. These days Shelley writes smart, funny novels for teens and big, edgy romantic suspense. A six-time Romance Writers of America Golden Heart Finalist, she lives and loves in Arizona with her family and the world’s neediest rescue Weimaraner. When she’s not behind the keyboard, you’ll find her baking high-calorie, high-fat desserts and haunting local farmers markets for the perfect plum.